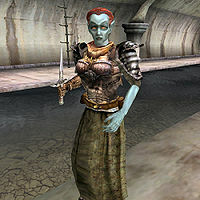 The Dreamer Prophet is a red-haired woman found in the Vivec Foreign Quarter western Underworks, who is responsible for some mysterious killings that are of great concern to the Ordinator Elam Andas. The "prophet" is wielding a Dagoth Dagger, which rapidly drains its victim's fatigue. She also has a Crude Bronze Key that opens a cell in Mamaea, Sanctum of Black Hope. This page was last modified on 25 June 2013, at 01:46.